Cape Town - The Proteas have lost their No 1 ranking in one-day international cricket following their narrow one-wicket loss to New Zealand in Paarl on Saturday. South Africa slipped from top spot to No 3, with India taking the No 1 slot after their seven-wicket win over England on Saturday. Despite their loss, England remain ahead of South Africa in second position. The Indians have 119 rating points, followed by England on 118, with South Africa on 116, while Sri Lanka and Australia share fourth spot with 111 points. The Proteas also received further bad news on Sunday when captain AB de Villiers was suspended for two matches due to his team's slow over-rate against the Kiwis. 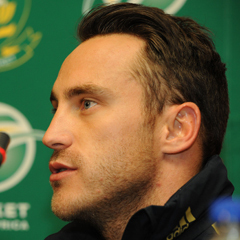 Faf du Plessis will take over the captaincy reins for the remaining two matches in the series, with David Miller called up to the squad as batting reinforcement.